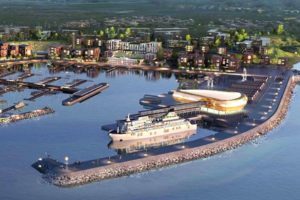 The Russian Federal State Enterprise “Rosmorport” announced the general contractor for the construction of the international sea terminal Pionersky to accommodate cruise ships and ferries in Kaliningrad region, Russia, informs Rosmorport’s press service. Bolwerk LLC, a Russian company headquartered in Samara, has won the tender announced by Rosmorport at the end of October. Bolwerk is specializing in coastal management, construction of cargo and passenger berths, dams, embankments, bridges. The company has been working on many projects in various parts of Russia, mostly on river quay wall construction. The opening bid for the contract was RUR 7.39 bln. Bolwerk’s price is RUR 7.313 bln (USD 125 mln by today’s rate). There were two bids at the tender, Bolwerk’s bid has been declared as complying with the Federal law governing the state purchases. Rosmorport does not disclose the other bidder, however according to the local media, that was Transstroy, a major infrastructure construction holding from Moscow, a former Soviet Ministry of Transport Construction, with as much as 60 years of experience in the sector. Its bid has been acknowledged not complying with the requirements. The state contract with Bolwerk LLC will be signed after the confirmation of the Federal Anti-Monopoly Service is obtained. – constructing a passenger terminal building, a border crossing point for passengers and general engineering facilities and installing aids to navigation. According to the state contract terms, Rosmorport and the general contractor will sign an investment agreement, whereby the latter shall construct, with its own or attracted funding, the passenger terminal building as well as the drainage system. Whether Bolwerk will be also responsible for dredging, land reclamation and coastal management remains unclear.